We had breakfast at the Moose Cafe in Dwight, near the Algonquin Park in Ontario, Canada. And what did we find on the table? 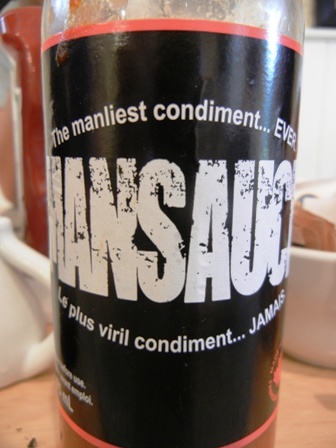 “Mansauce”, it was called, the “manliest condiment”. That’s quite a promise. Unfortunately, we are coming from Asia and used to hot stuff. Sweet chili sauce comes to mind after I tasted the “manliest of the condiments”. Bring on the hot stuff Canada. But of cause we are having a great time up here in northern Ontario. This entry was posted on Saturday, July 30th, 2011 at 7:23 am and is filed under culture, food. You can follow any responses to this entry through the RSS 2.0 feed. You can leave a response, or trackback from your own site. Ontario, where men are men and moose are invisible. Hello! This is Chris from Mansauce! We are glad you tried our condiment! We are a medium heat condiment, we don’t try to be a killer hot sauce, hope you enjoyed it, don’t be afraid to pick up a bottle to take back home!